يشكل Citylife Wellington Hotel بموقعه الممتاز في ولنجتون نقطة انطلاق جيدة لاستكشاف هذه المدينة النابضة بالحياة. إن موقعه الجيد الذي يبعد فقط عن مركز المدينة يساعد النزلاء على الاستمتاع بمعالم المدينة ونشاطاتها. إن سهولة الوصول من الفندق إلى المعالم السياحية الشهيرة الكثيرة في المدينة كمثل Tarot Zamm - Tarot Reader Wellington, The Wellington Cable Car, The Vault Design Store هو استثنائي بحد ذاته. يعمل Citylife Wellington Hotel على ضمان إقامة مريحة لضيوفه من خلال خدماته الممتازة وحسن ضيافته. يمكن لضيوف الفندق الاستمتاع بالميزات التالية على أرض الفندق: خدمة الغرف على مدار الساعة, واي فاي مجاني في جميع الغرف, مكتب الاستقبال على مدار الساعة, مرافق مخصصة لذوي الاحتياجات الخاصة, تخزين الأمتعة . بالإضافة لهذا,تتضمن كل غرف الضيوف مجموعة واسعة من وسائل الراحة . بعض الغرف توفر حتى تلفزيون بشاشة مسطحة, غرف لغير المدخنين, مكيف هواء, تدفئة, مكتب لإرضاء أكثر الضيوف تطلباً. يقدم الفندق مجموعة رائعة من الخدمات كمثل مركز للياقة البدنية، لجعل إقامتك تجربة لا تنسى. إن Citylife Wellington Hotel هو خيار ذكي بالنسبة للمسافرين إلى ولنجتون، بما يوفره من إقامة هادئة ومرحة. We liked the two bedroom suite which was newly refurbished, cosy and comfortable. However, we were disappointed that the staff didn’t inform us beforehand that parking was chargeable at $23 per day. The wifi allowance was also unclear, the login stated that it was limited to 2GB per day (which only lasted for awhile). Wonderful weekend stay in a very convenient location. Great suite meeting all our needs, highly recommend. You can easily take the airport shuttle to this hotel with 1min of walking. The location is great. Room was spacious and facilities are clean. At night there will be faint sound from the cars on the road. Easy access around cbd area. Very convenient in terms of food, shopping as well as groceries. The room lighting is bright as well and make life easy especially need to do some work. Internet speed was good. Overall, I am satisfied with my stay. Will definitely come back again. We were arrived very early at around 8a.m. in the morning in Wellington as we come by intercity overnight bus from Auckland. We thought we would need to spend our morning somewhere else, but we tried to ask for an early check-in and the staffs were kind enough to let us check-in very early. 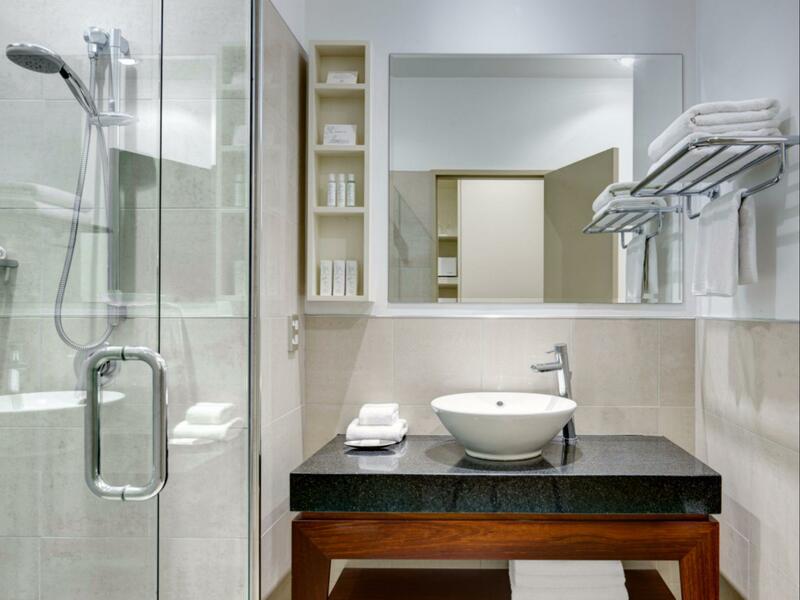 The location is fantastic right smack downtown in the shopping district; one would enter the discrete hotel entrance right off the main thoroughfare. The hotel offers good value for money and the staff are most helpful and friendly. Our only gripe we have about the hotel is it is really difficult to find. You need a much bigger & brighter street sign. As we don't have GPS it was extremely difficult to firstly actually locate the hotel and then even more difficult to find the car parking, as there is nowhere to pull up outside the hotel front entrance to get parking instructions. Staff were friendly but the parking and construction let the whole place down. When we arrived we were told we were lucky and were going to get a park at the front at reception. We went out in the car and when we came back there was a van parked in "our park". So basically, we were lied too earlier when we were told we had that park reserved for us. We then had to drive down to the alternative parking further down the street. Super frustrating when you are travelling around in and out all day and just want to jump in your car and go. We wouldn't stay there again. There was construction going on in the street at all hours of the night and the rooms are not very well insulated for the noise either. They are updating the rooms apparently which is good for them because our room was old. The chip board door in the bathroom was warped at the bottom. The heated towel rack was way too close to the toilet. It was just old and well overdue for an update. Very helpful staff, especially upon check-in. Room location was a bit difficult for me, as access included a flight of stairs to the next floor AFTER exiting the elevator. The elevator didn't go to that floor. In the room, it seemed to be missing some furniture. In the main living area, there was no reading lamp and no place to sit other than the sofa. In order to read, I had to sit at the dining table, as it had the only lights suitable for reading. In the bedroom closest to the kitchen and main bath, the reading lights for the bed were functional for the first night only. When I attempted to use them on the second night, they didn't function, despite my trouble-shooting attempts with the various switches. In this same bedroom, there was no table underneath the wall-mounted television; the only "furniture" in this room was the silent butler (valet stand). This was my favorite CItyLife hotel so far! 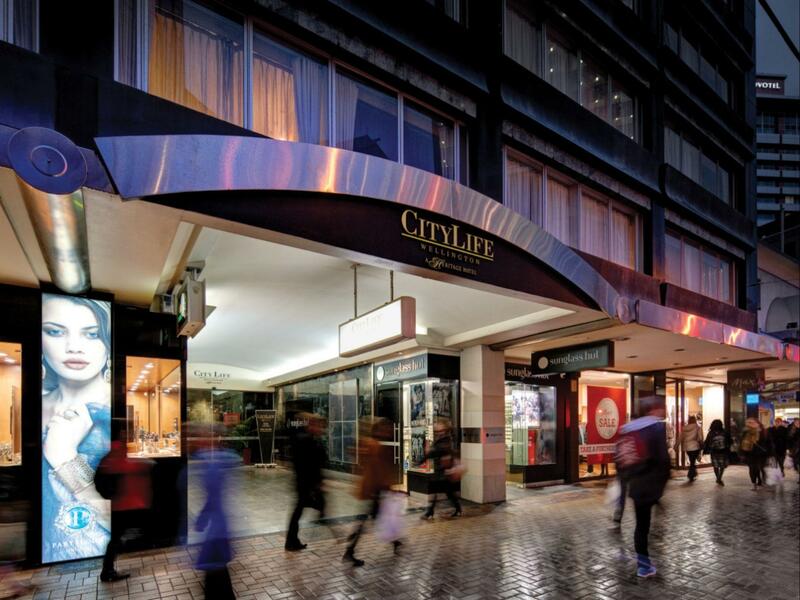 I stayed in the Auckland property, but preferred this one: CityLife Wellington. First off, I got a free upgrade to the Directors Suite. It was huge, spacious, and comfortable. 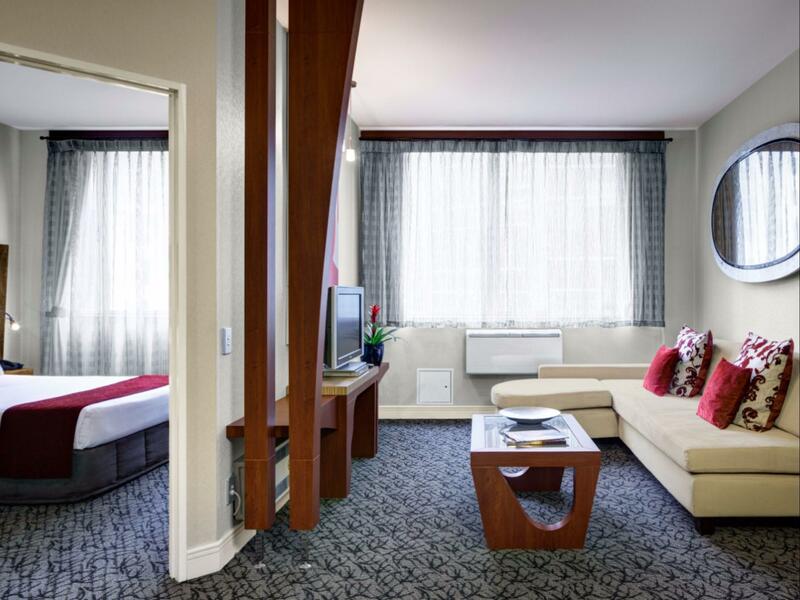 A large King Size bed in the main room, a huge bathroom, and even larger living and dining space. It was great having a full kitchen. There was a bonus room (for kids I assume) with 2 twin size beds and their own bathroom. The location is absolutely perfect. 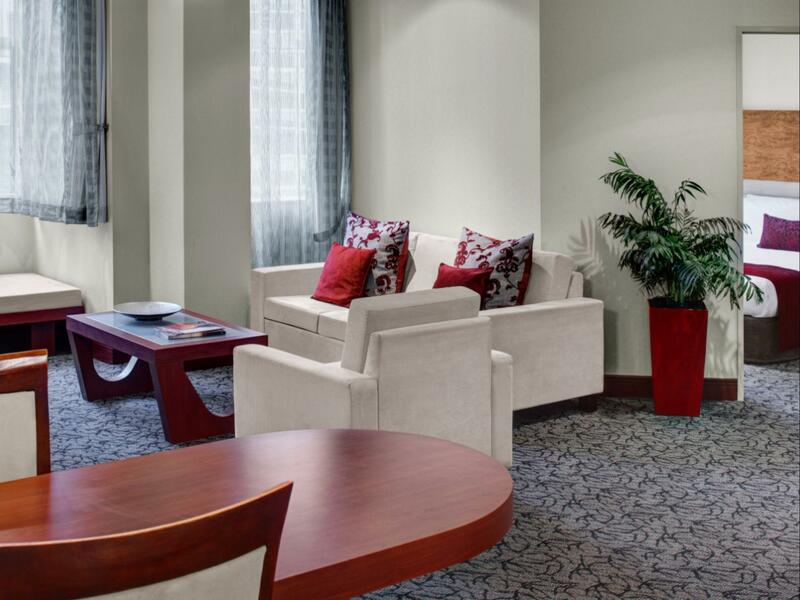 You are walking distance to all the major shops, restaurants, and landmarks. Very convenient. If you are using Uber to the location be sure to use the 14 Gilmer Terrace address as a drop-off/pick-up point. The hotel has two entrances: one at street level at a busy street and an upper hotel reception/parking entrance. I would love to stay here again. 5 min walk to gondola ride, great place & close to cougar street restaurants. Try Ombra 199 cougar st- quality service & food is delicious. Everything about the CityLife was very pleasant. Easy check in, room was clean, close to a lot, especially the trolley. We had a great walk down from the top. As for staff, Gillian was really helpful and a super resource! We were right next to the Cable Cars and several restaurants near by. Hotel also has a deal with Domino's Pizza and several different type of Restaurants to deliver the food to your room. Parking is available for a premium but that is normal for all Wellington Hotels. We ended up walking because everything was soo close by. Railway station is literally 10-15 mins walk...depending how fast you walk! Staff were great, friendly and always with a smile. This is a very well located apartment building, it is right in the centre of Wellington. We found our room very clean and roomy enough for all 4 of us. The staff on the front desk are very helpful. We would recommend it to families. The room some was perfect for 4 adults plus a baby. Having a kitchen was most useful and convenient. The staff were very helpful in arranging things for us and making our stay comfortable. I was pleased to see a recycling bin although a washing machine and dishwasher slightly contradict the apparent environmental awareness! Overall, a most successful stay and we would happily revisit one day. New Year time meant Wellington was quite quiet so if you are looking for lots of restaurant choices, choose another time of year! 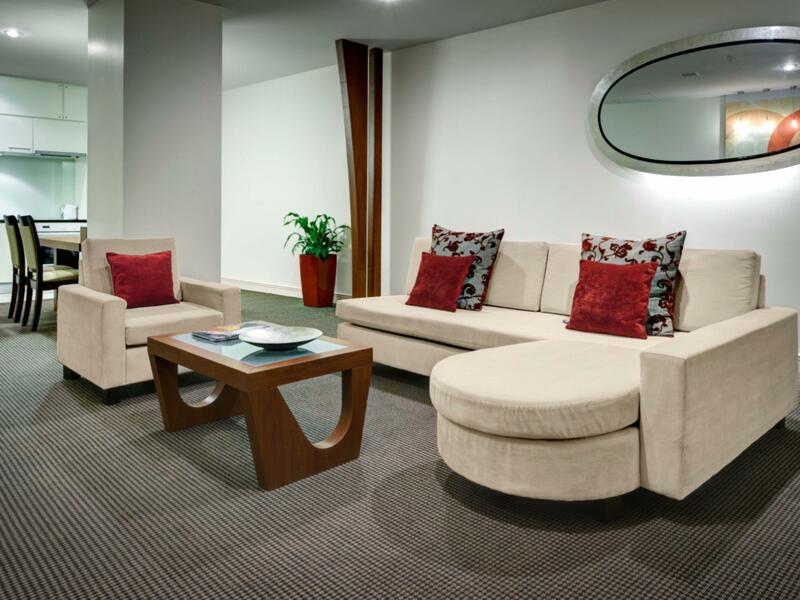 We have thoroughly enjoyed our stay at the 'Executive 2 bedroom Suite' at Citylife Wellington. The suite has offered more than we expected: other than a full kitchen and everything else that any hotel provides (i.e. tv's, dvd player, hair dryer, alarm clocks, iron & iron board etc) , there was dishwasher, washing machine & dryer, wall hung heater & a heat pump (there are even laundry powder, dishwashing liquid and dishwasher powder supplied) . All these make the stay with young kids easier. The suite & facility inside was clean and tidy, and we got our quiet room as requested. Will definitely stay again in the future. p.s. we never ordered food from the hotel so I could only put a '3' for the 'food & dinning' section above. Excellent. We were given a complimentary upgrade to a one-bedroom apartment. This was great, very spacious and comfortable. The city traffic was not a problem as we thought it may have been. There was a spacious lounge and dining area, kitchen and laundry. The bed was extremely comfy - wow, a great nights sleep after our walking and touring the city. We would definitely stay there again.